Bangla Food Festival is an event that took place between 12-May-2006 and 22-May-2006 in Hyderabad. The Bangla Food Festival at M's is all set to demolish your carefully laid out dietary plans. You might as well chuck the diet chart out the window. 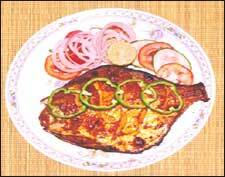 You can't refuse the appetizing fish dish, bhata ilish and the fiery rahu kalia. There are some delicious bhajas including fried brinjal bhaja and fried ladyfinger bhaja. Mouth-watering sweets like cham cham, sondesh and gajja are all yours for the taking. Please contact 5525-0055/5525-0066/99495-30003(Abdul)/99497-03123(Ali) for futher details. Be the first to comment on Bangla Food Festival! Just use the simple form below. fullhyd.com has 700,000+ monthly visits. Tell Hyderabad what you feel about Bangla Food Festival!